President Uhuru Kenyatta is greeted by Deputy President William Ruto (file photo). 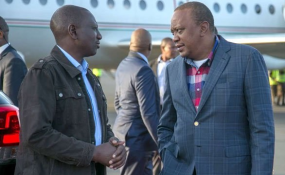 Deputy President (DP) William Ruto says President Uhuru Kenyatta is the only person who matters to him in the debate over his bid for the top seat in the 2022 election. "The person who matters to me is Mr Kenyatta. There are very many people who are opposed to my candidature. But there are millions who believe that I am fit for the job. And I want to tell you that it will not take one person, a gang or a group to decide who becomes President of Kenya or, for that matter, who becomes the candidate of Jubilee. It will take the entire Jubilee Party leadership and membership and 45 million Kenyans to decide who becomes President," he said during an interview on the BBC television's HARDtalk programme that aired Tuesday. Dr Ruto acknowledged that the land on which his Weston Hotel stands was illegally acquired, but added that the rightful owner, the Kenya Civil Aviation Authority, would be compensated by those who sold the land to the hotel's developers. He told the programme's host, Stephen Sackur, that the recently created powerful Cabinet Committee that oversees government development projects and is headed by Dr Fred Matiang'i was not set up to sideline him because it reports to him and President Kenyatta. The DP declined to go public about his wealth, only saying: "I have nothing to hide." He has been in England since last week, giving a series of public lectures. SACKUR: Tell me about the Weston Hotel, which you own, which is worth an awful lot of money and which is sitting on illegally acquired land. RUTO:Weston Hotel is a big story. SACKUR:It is. Kenyans are following. RUTO: In fact, you will want to believe that Weston Hotel occupies half of Nairobi. Weston Hotel sits on 0.7 hectares of land, among the 70,000 hectares for the city of Nairobi. Illegally acquired land; land which actually belongs to the Kenya Civil Aviation Authority and then you miraculously acquired it and built a hotel. RUTO:For your information, Weston Hotel was bought. RUTO:Not bought illegally. In fact, for the record, the National Land Commission has made a finding that Weston was an innocent purchaser from somebody who got it illegally, and reparations have been made constitutionally to restore that land to the civil aviation authority by demanding that those who sold the land to us must pay. SACKUR: Why have you not followed the President's instruction in what he calls a lifestyle audit to go public with all your wealth and assets, itemise all of it and show it to the Kenyan public? RUTO: For the record, I'm the only politician in Kenya who has been subjected to a lifestyle audit. RUTO: The audit was done by the media. It is in the public domain. At the moment, we are all working on getting a legal framework where a lifestyle audit can be conducted on every public servant, starting from the President. RUTO: For your information, Sackur, you are behind the news on that matter. Every public figure, by law, is supposed to submit a list of assets and liabilities to the Speaker of the National Assembly. That I have done. The media has gone further to carry a lifestyle audit on me, the only politician who has been subjected to a lifestyle audit by the media. SACKUR: But if it's in the public domain, it's not a secret. So, tell me; how much are you worth? RUTO: It is in the public domain. I encourage you to google and find out what William Ruto owns. SACKUR: Will you or will you not tell me, given that you've been completely open and public with it and that every Kenyan knows this figure, according to you? RUTO: I encourage you, to go to the website on Parliament and get that information. RUTO: Of course, it does. It doesn't make sense to you? RUTO: Why don't you want to do your homework? SACKUR: I'm very keen on doing my homework. RUTO: Please, do your homework, and get the numbers. And I want to promise you, when the legal framework is established finally by all of us as government, I will submit myself to a lifestyle audit. I have nothing to hide. I have earned every cent that I own in a legal and transparent manner. SACKUR: You say you've already done it, and now you tell me in the future tense that you will commit yourself to q lifestyle audit. I'm very confused about whether you've actually done it. RUTO: What the law provides, Sackur, if I can educate you a bit; what the law provided for is that everybody must submit the list of assets and liabilities to the Speaker when you're vying. We have since elevated that to the next level; that there must be a lifestyle audit. And the legal framework is being worked out for it, but what I told you is that the media has already carried out a lifestyle audit on me. SACKUR: What did you feel when the deputy chairman of the party in which you have been a part with President Kenyatta resigned from his post saying he felt there was a non-acceptable conflict of interest as he now felt he had to join a legal case against you to ensure you could not run for president in 2022? People close to Uhuru Kenyatta have completely lost faith in you. RUTO: The person that matters to me is Uhuru Kenyatta. For your information, the vice-chair you are referring to walked away because he overreached himself and said things that he wanted the country to believe was Mr Kenyatta's position when it was not. SACKUR: Murathe says you are not fit to be Kenya's next president. RUTO: There are very many people who are opposed to my candidature. But there are millions who believe that I am fit for the job. And I want to tell you that it will not take one person, a gang or a group to decide who becomes president of Kenya or, for that matter, who becomes the candidate of Jubilee. It will take the entire Jubilee Party leadership and party membership and it will then take 45 million Kenyans to decide who becomes president. SACKUR: But you see, if one looks at politics in Kenya today, we see factions fighting. We see, according to the Nation newspaper in Nairobi, that inside the Jubilee Party, there are now different factions and you have a group working for you for the 'Tanga Tanga' group who are now actively seeking to push your candidacy for 2022. What is going on? RUTO: Let me tell you: Jubilee is focused. The last five years, we did a tremendous job. These five years, we will do even better. What you read there is stories, newspaper stories. SACKUR: With respect, it's not stories. RUTO: And for your information, all that has no basis at all. SACKUR: It is not stories when the President himself recently said, 'The public will judge the potential candidates for president in 2022 based on their policies rather than any political party affiliation or where in the country they come from.' In fact, it does look -- given that he's just appointed the Interior minister to chair the key committee supervising the government's big ambitions -- as though you've been sidelined. RUTO: Those 'sidelined' stories have no basis at all. The functions of a deputy president are in the Constitution. SACKUR: But the president no longer trusts you. RUTO: The president and I agreed on how we are going to make government much more efficient and to deliver. SACKUR: This committee has been instructed to supervise all the key government projects and ambitions. RUTO: His committee is a Cabinet Committee. That committee reports to the President and myself. How on earth can you talk about sidelining? SACKUR: If we look at the political situation inside the government today, it is driven by factionalism, by jockeying for positions and you in particular, are seen as somebody who has, in a sense, lost that solid partnership with President Kenyatta, and that is now seen as a source of tension. RUTO: Let me tell you for the record. The understanding between me and President Kenyatta is rock-solid. We know where we work, we know where we are and we know where we are going. Our assembling of the Big Four was informed by the success that became of our programme and country over the last five years. We have a solid track record to rely on. SACKUR: Why is the Kenyan government seemingly incapable of eliminating the threats posed by Al-Shabaab and the jihadists? RUTO: Terrorism is an international challenge. No country in the world has ever claimed to eliminate terrorism. We keep working on it. What I can tell you is that we are getting better at dealing with this challenge. If the response of the Dusit D2 attack was anything to go by, the response time was seven minutes; all systems were there. RUTO: These are routine alerts, and we took those alerts seriously, that's why we have managed to contain that situation to a minimum. SACKUR: You are telling me that your military commitment in Somalia is open-ended; indefinite. RUTO: It is indefinite until we are certain that Somalia is safe. It will be reckless for us to walk away from a threat that threatens our country.